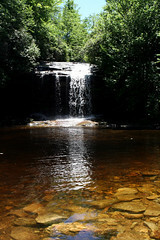 All summer long children can enjoy their environment and learn from it in Highlands North Carolina. The Highlands Nature Center offers programs for all ages on a weekly basis, allowing children to experience and play in nature at the same time. Sample programs include “Wow! A World of Wonder”, for children ages 4 through 6, where children play games, hike and explore the world around them. “Amazing Animals” is a program for 7 through 10 years of age that exposes children to a variety of animals and allows them the opportunity to observe them in their habitats. “Junior Ecologists” exposes children ages 11 through 14 to the life of a field biologist. Whatever the age, children in Highlands NC get the chance to learn more about the area around them this summer. Highlands is a spectacular part of Western North Carolina, surrounded by natural beauty and the Highlands Nature Center offers a unique opportunity to enjoy and explore this wonderful mountain area. Click here to visit the Highlands Nature Center website and learn more about the programs that are being offered this summer.